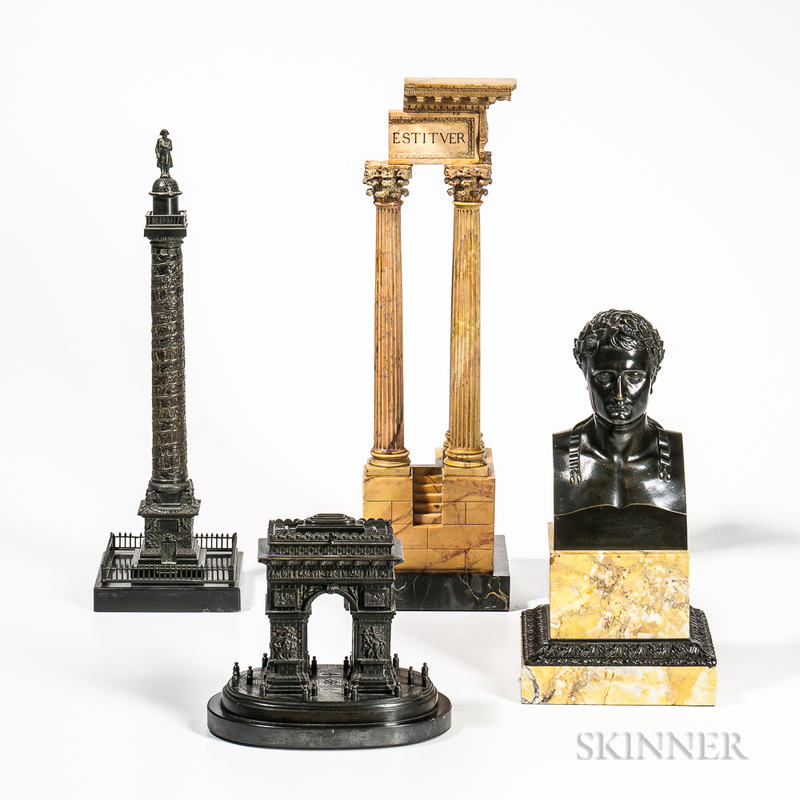 Focus on Europe | Skinner October 13th Auction | Skinner Inc.
October features fresh to the market material from private collections from New England and the Mid-Atlantic States including Grand Tour sculpture from the collection of Frederic and Jean Sharf. Frederic Sharf (1934-2017) was a collector, businessman, historian, author, and philanthropist. A Museum of Fine Arts, Boston, Honorary Trustee, and Millennial Benefactor, with his wife Jean, Sharf was instrumental in shaping the MFA’s collections of design drawings and jewelry, donating thousands of objects and helping make the museum an international leader in these fields. The Sharf collection includes numerous examples of grand tour monuments primarily in bronze as well as Napoleonic busts and figures. A selection of over 150 lots of silver by well-regarded American and European makers is led by stunning George III Sterling Silver Six-arm Epergne, London, 1763-64, David Smith & Robert Sharp, makers (lot 4, estimate: $4,000-6,000). 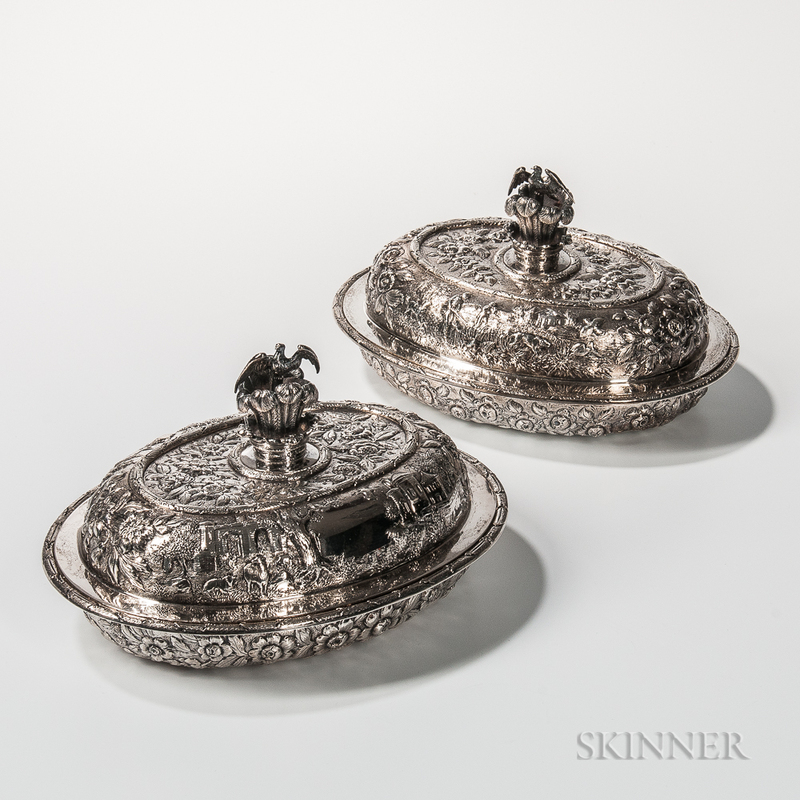 Two Kirk & Son .917 Silver Covered Tureens (lot 75, estimate: $12,000-18,000), and an Extensive Georg Jensen “Acorn” Pattern Sterling Silver Flatware Service, (lot 46, estimate: $8,000-12,000). Twelve lots of Martin Brothers stoneware epitomize the breadth and quality of wares produced by the firm. 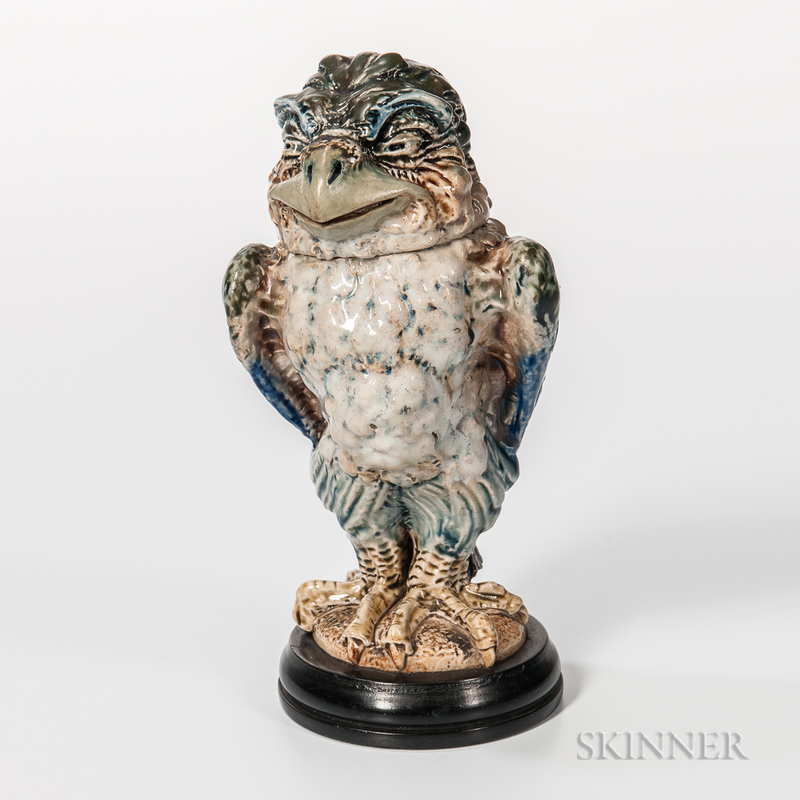 Included are vases, double-face jugs, and a Wally-bird Jar and Cover (lot 374, estimate: $8,000-12,000). Perhaps the most unusual example from the group is a Martin Brothers Harvard-Yale Regatta Trophy (lot 376, estimate: $20,000-30,000) that was awarded to the winning eight of the 1891 Harvard-Yale Boat Race. In addition to Martin Brothers, English ceramic offerings also include pieces by Wedgwood, Clarice Cliff, Minton, and Moorcroft, while European ceramic lots include works by Rozenburg, Gouda, Boch Freres, and Herend. The sale features a significant collection of over 100 antique and modern glass paperweights. Antique examples feature the work of Clichy, New England Glass Company, Saint Louis, and Baccarat. Modern makers include Ayotte, Richardson, Rosenfeld, Stankard, Cristal d’Albret, Trabucco, Orient and Flume, and Ruzsa. The decorative art offerings in the sale feature many fine mantel clock and clock garnitures, including a Royal Vienna Porcelain Portico Mantel Clock (lot 456, estimate: $2,000-4,000) and a massive Three-piece Bronze and Silver Plate Clock Garniture, (lot 162, estimate: $4,000-6,000). Furniture offerings are led by a Louis XIV-style Ormolu-mounted Boullework Lacquered Cabinet (lot 192, estimate: $3,000-5,000) as well as a Giltwood Center Table (lot 402, estimate: $6,000-8,000) featuring porcelain plaques of Art Nouveau beauties. Previews for the auction will be held in Boston on October 11, 12PM-5PM and on October 12, 12PM-8PM. Free and open to the public, specialists will be on hand to answer questions. Auction catalogs may be purchased at www.skinnerinc.com. Incorporating Antiques: Through the Eye of an Interior Designer – Join us for an Evening with Phillip Thomas of Phillip Thomas, Inc. on October 12, reception at 5:30PM, talk at 6PM. Skinner is excited to have had the opportunity to collaborate with interior designer Phillip Thomas— the European Furniture & Decorative Arts auction an ideal platform to showcase Phillip’s talent for seamlessly mixing an eclectic combination of antique objects, furniture, and works of art, all inspired by the property in this auction. Phillip artfully shows how to incorporate antiques in today’s interiors. This entry was posted in Blog, News and tagged antique furniture, antique silver, British silver, decorative arts, european furniture, french clocks, French furniture, georgian furniture, giltwood, gorham silver, Louis XV, Louis XVI, martin brothers, silver flatware services, silver holloware, silverware, tiffany silver, wedgwood by Skinner. Bookmark the permalink.